The International Space Station has been in space since the first element was launched on November 20, 1988. With the launch of Soyuz TM-31 and the Expedition-1 crew on October 31, 2000, the ISS has been continuously manned. Their main work was to activate the critical life support systems and conduct the first scientific work onboard the space station. The Expedition-1 crew consisted of Yuri Gidzenko, Sergei Krikalev and Bill Shepherd. After four and a half months, they returned to Earth with the STS-102 crew and landed at the Kennedy Space Center on March 21, 2001. The Soyuz TM-31 spacecraft remained docked to the ISS to act as a rescue vehicle. 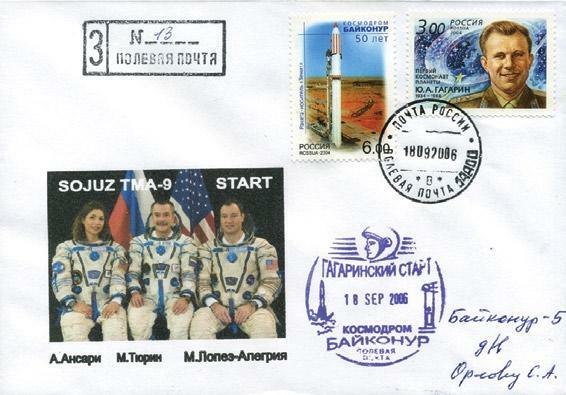 There are four distinct postmarks on this Soyuz TM-31 launch cover, all dated on October 31, 2000 with the imprimatur of “Mail of Russia” at the top and “Kazakhstan, Baikonur” spelled two ways in each hub. One cancel depicts the Soyuz rocket while another has the spacecraft in orbit above the planet. 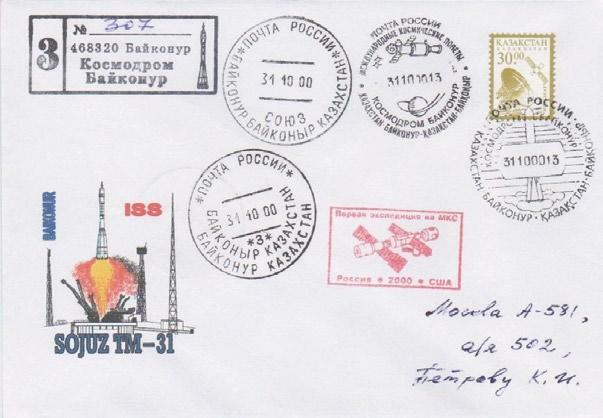 A rubber stamp Registered Mail imprint appears in the top left corner, with Baikonur’s postcode “468320” and text, “Cosmodrome / Baikonur” plus artwork of the Soyuz rocket – this cover has been numbered 307, out of an unknown quantity. The multicolored cachet notes the mission’s goal of the ISS, but fails to mention that it is the first Expedition to go up, but the red rubber stamp depicts the Soyuz docking with the fledgling ISS with the text “First expedition on ISS / Russia - 2000 - USA”. The space-themed Kazakhstan stamp (s.261) of 30 tenge, depicts a communication satellite above a receiver dish. The second Soyuz flight to the ISS was the Taxi-1/Mission-2S/Soyuz TM-32 spacecraft that launched on April 28, 2001 with a crew consisting of Talgat Musabayev, Yuri Baturin and Space Flight Participant, Dennis Tito (who paid about 20 million dollars for the privilege of being the first “space tourist”). The Soyuz TM-32 docked with the ISS on April 30, 2001. The mission was to conduct the scheduled replacement of the Soyuz TM-31 spacecraft, functioning as a rescue vehicle, with the Soyuz TM-32. Since a Soyuz-TM spacecraft has an orbital lifetime of six months, the swap out of vehicles is performed during each visiting mission. The Soyuz TM-31 spacecraft with the Soyuz TM-32 crew landed safely a week after launch on May 6, 2001, about 90 kilometers north of Arkalyk, a city in northern Kazakhstan. This cover bears two Russian postage stamps – one (s. 6426) features the Ostankino Television Tower in Moscow, the other (s. 6584) has the International Space Station. There are five postmarks, three which look similar but one has a Soyuz imprint, another has an ISS (MKC) imprint, while the third has *C*, which might mean the Cosmodrome, but that’s just a guess. The Soyuz rocket and orbiting spacecraft pictorial cancels also appear. The cachet features a Soyuz FG rocket. The “3” character (a Cyrillic ‘Z’) in the corner hand-stamp is the first letter of the Russian word Zakaznoe (Registered) and is used for Registered Mail going to an address inside Russia. Six months later, the next flight was Taxi-2/Mission-3S/Soyuz TM-33 spacecraft, launched from the Baikonur Cosmodrome on October 21, 2001 with a crew consisting of Victor Afanasyev, Konstantin Kozeyev and ESA astronaut Claudie Haigneré (the first European woman to visit the ISS). This Andromède mission docked with the ISS two days later on October 23. During this fourteenth manned mission to the ISS, spationaut Haigneré carried out a scientific and technical research program known as the Andromède’s mission, organized by CNES, the French space agency, performed in the Russian module as a preliminary scientific operation aboard the ISS, comprising of Earth observations, biological, and materials sciences. Ten days later the Soyuz TM-32 “life boat” spacecraft departed with the TM-33 crew and landed safely on October 31, 2001 near the Kazakhstan city of Arkalyk. 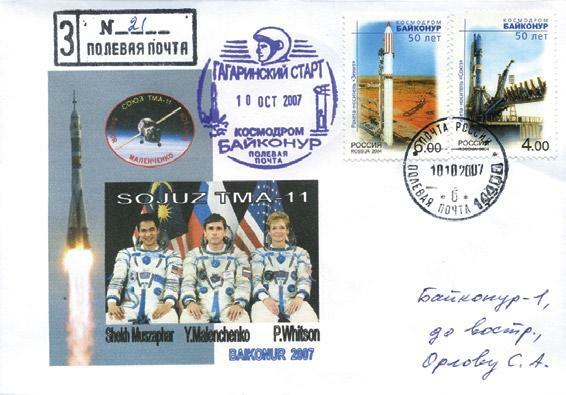 Familiar pictorial and Baikonur postmarks appear on this launch cover all with the October 21, 2001 date, along with a double-ringed postmark with the top text translating as Rosaviakosmos, the Russian Aviation and Space Agency; followed by Ð­ÐŸ-2 Ð½Ð° ÐœÐ¡Ðš (EP-2 to MCK): the EP-2 refers to the Soyuz TM-32 spacecraft and MCK is the Russian acronym for the International Space Station. EKA is Russian for ESA, the European Space Agency, and KHEC is the Russian translation of CNES, the French space agency, Centre National d’Etudes Spatiales. The three names in the center are Afanasyev, Haigneré, and Kozeyev. Again, the rubber stamp Registered Mail in the top left corner has not been numbered. 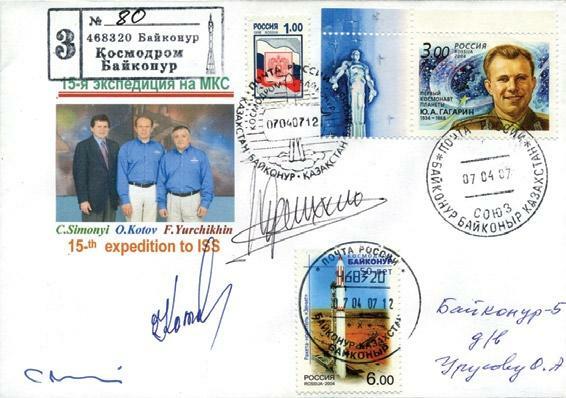 The cachet features the Soyuz spacecraft and, from left to right, Kozeyev, Afanasyev, and Haigneré. The last Soyuz TM flight was the Taxi-3/Mission-4S/Soyuz TM-34 spacecraft launched on April 25, 2002 with Yuri Gidzenko, ESA astronaut Robert Vittori (Italy) and Space Flight Participant, Mark Shuttleworth, a South African entrepreneur who had developed Internet security protocols. As the second “space tourist”, Shuttleworth carried out a small research program studying ocean life along with biological experiments to combat AIDS and other diseases. After eight days onboard the ISS, the lifeboat Soyuz TM-33 spacecraft undocked with the Soyuz TM-34 crew and touched down safely on May 5, 2002 twenty-six kilometers southeast of Arkalyk. 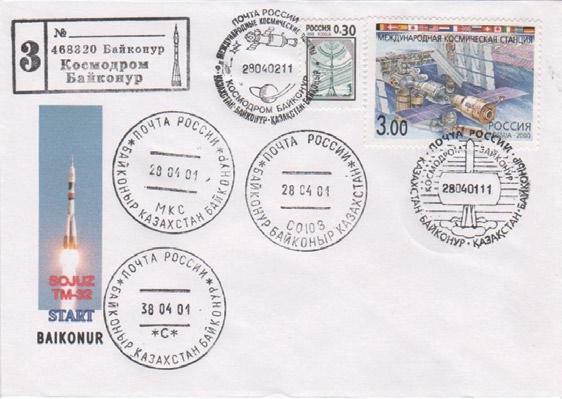 This launch cover is postmarked with the two pictorial postmarks from Baikonur, Kazakhstan, plus a variation of the textual postmark, with an italic Ð± prefix below the date, possibly indicating the Baikonur postal district. Note that the date stamps use the full year 2002 instead of a truncated 02 and that the postage cost an extra ruble, as indicated with the Russian flag stamp (s. 6428). Once again, the Registered Mail rubber stamp is blank, and may appear simply for prestige. The cachet shows, from left to right, Vittori and Gidzenko with their flight manuals next to Shuttleworth during a pause in their training session. On October 30, 2002, the Taxi-4/Mission-5S/Soyuz TMA-1 spacecraft launched with crew consisting of Sergei Zalyotin, Frank DeWinne, the first Belgian astronaut to the ISS, and Yuri Lonchakov. American musician Lance Bass was originally scheduled as part of the crew but by September 2002 his training was discontinued due to his inability to meet the terms of the space tourist contract. The primary goal of this flight was validating the Soyuz TMA-1 spacecraft, which performed as expected. While visiting the ISS, Frank DeWinne worked on a Belgian sponsored experiment regime using a Microgravity Science Glovebox. Eleven days after launch, the Soyuz TMA-1 crew landed safely on November 9, 2002 aboard the Soyuz TM-34 spacecraft 80 kilometers northeast of Arkalyk, Kazakhstan. 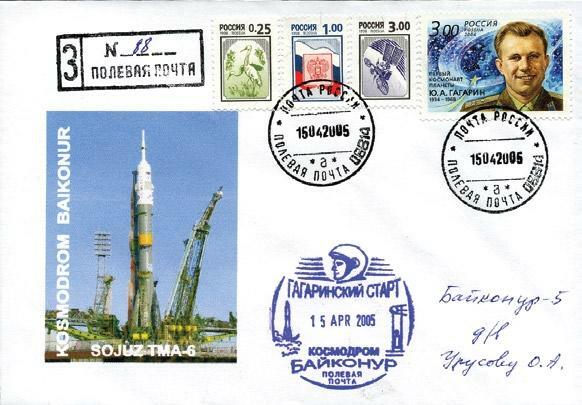 Along with the change of the Soyuz spacecraft, the cover sports a radical change of postmarks and hand stamps. The left top corner Registered Mail rubber stamp has been updated to read “THE FIELD POST OFFICE” and has a sans serif font. 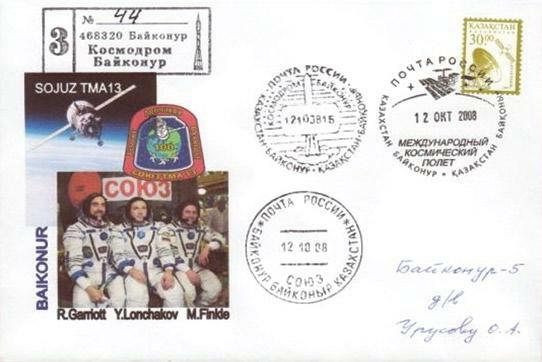 The oval hand stamp to the right flanked by a Russian flag and European Union banner, has only two of the cosmonauts, Zalyotin and DeWinne, reflecting Lonchakov’s late entry onboard, as Lance Bass’ empty seat was originally slated for cargo. The Russian Post cancel is struck twice over a Gagarin 40th Anniversary stamp (s. 6634b) and an electric railway stamp (s. 6430) and now bears the “Field Post” legend at the bottom instead of Baikonur, Kazakhstan, and has a prefix below the date, which has reverted back to a two digit year format. The blue pictorial postmark is headlined “Gagarin Start” with a stylized cosmonaut, presumably Yuri Ga- garin, above. The date is flanked by a Vostok rocket and a Sputnik satellite, with the text “Cosmodrome Baikonur Field Post” below. This cover is marked as the fifty-third of sixty produced in the lower right corner and is signed by Zalyotin above the cachet and (possibly Lonchakov) and DeWinne below. The cachet features the “Odissea” mission emblem with the red text below indicating this was the fourth expedition visiting the ISS, with “RUSSIA * BELGIUM” below. While the Soyuz TMA-1 was attached to the ISS, the February 2003 Columbia shuttle accident occurred, causing amajor change in the ISS crew swap outprocess – the expedition crews were reduced to two participants and the Soyuz system would be the only method of launching a crew to and from the ISS for the next two years. The second TMA flight to the ISS was the Mission-6S/Soyuz TMA-2 spacecraft launched on April 26, 2003, from Baikonur with the Expedition-7 crew of Yuri Malenchenko and Ed Lu. Eight days after the TMA-2 launch, the Soyuz TMA-1 spacecraft with Expedition-6 crew of Ken Bowersox, Don Pettit and Nikolai Budarin left the ISS on May 4, 2003, marking the first atmospheric entry and descent for this Soyuz class. A technical malfunction caused the Soyuz to fall into a bone-rattling ballistic reentry instead of the planned gentler descent, resulting in an off target landing three hundred miles short of the planned location. During the steep re-entry the antenna was ripped off and the two back-up ones failed to deploy. The crew was able to reestablish communications using an emergency transmitter after landing. Some two hours after landing, at 08:21 Moscow Time on May 4, pilots of the search and rescue team finally found the capsule with its crew outside the craft and waving to the plane, but it would take another three hours before the rescue team finally arrived because their helicopters had to be refueled. This cover has a cachet showing the Soyuz R7 rock et at the Baikonur launch site. The cover is franked with a 2.50 ruble definitive of the Kremlin buildings(s. 6431) and a three ruble stamp depicting Yuri Gagarin shaking the hand of rocket designer Sergei Korolev (s. 6634). 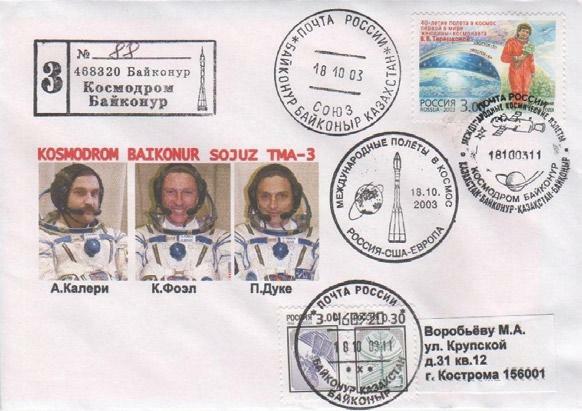 There are three black cancels for the April 26, 2003 launch date, including the Soyuz pictorial, the Soyuz/Baikonur hub, and the dual language Baikonur version with an “a” prefix below the date. The purple cancel is dated on May 2, 2003, which does not correspond with a significant event as the TMA-1 undocked on May 3, 2003. The Baikonur control rubber stamp next to the Gagarin stamp is of the type used for previous missions and bears a serial number of “5420”. In the lower left corner a Russian Post bar coded sticker has been affixed – it’s not for registered mail, but its purpose is unknown. The next flight was the Mission-7S/Soyuz TMA-3 spacecraft launched on October 18, 2003 with the Expedition-8 crew of cosmonaut Alexander Kaleri and U.S. astronaut Mike Foale, with ESA astronaut Pedro Duque from Spain accompanying them on the ride. Duque performed ESA sponsored science experiments under the mission name Cervantes. The Soyuz TMA-2 spacecraft undocked from the ISS on October 27 with Expedition-7 crew Yuri Malenchenko and Ed Lu, along with Pedro Duque, and landed safely on October 28, 2003 near Arkalyk, Kazakhstan. This launch cover sports two new postmarks in addition to the familiar Soyuz pictorial over the Valentina Tereshkova 40th anniversary stamp (s. 6777) and the Soyuz/Baikonur cancel. The Soyuz rocket with an orbital flight above Earth pictorial notes the “International Flight to Space” with “Russia-USA-Europe” participants. 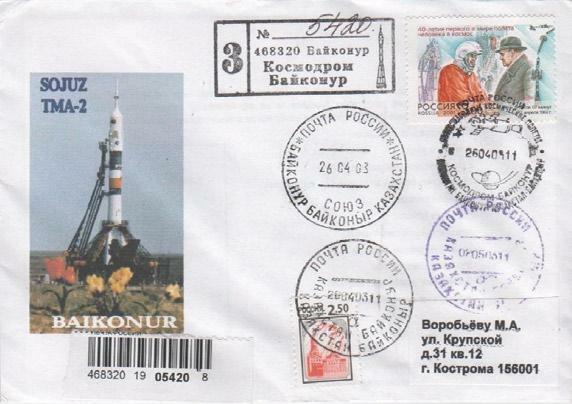 The Russian Post cancel over two definitives with a satellite and the Ostankino Television Tower (s. 6432, 6426), has Baikonur’s postcode “468320” above the date and an “x” prefix below, with “Baikonur” in two variations. 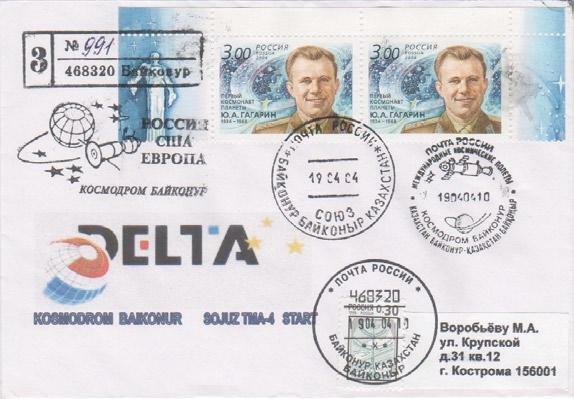 The “Cosmodrome Baikonur Soyuz TMA-3” cachet shows, from left to right, Kaleri, Foale, and Duque. The Expedition-9 crew consisting of Gennady Padalka and Mike Fincke, along with ESA astronaut Andre Kuipers from the Netherlands launched on April 19, 2004, aboard the Mission-8S/Soyuz TMA-4 spacecraft. Kuipers performed a series of experiments as part of the DELTA mission with a wide range of subjects: physiology, biology, microbiology, medicine, technological development, physics and Earth observation. The Soyuz TMA-3 spacecraft with Expedition-8 crew Alexander Kaleri and Mike Foale, along with Andre Kuipers, landed safely on April 30, 2004 near the perennial landing spot of Arkalyk, Kazakhstan, despite a minor helium leak that did not affect their mission. This cover’s cachet features the DELTA mission with a globe decked out in Netherlands’s flag colors, which coincidentally is also Russia’s and United States’ colors of red, white and blue. 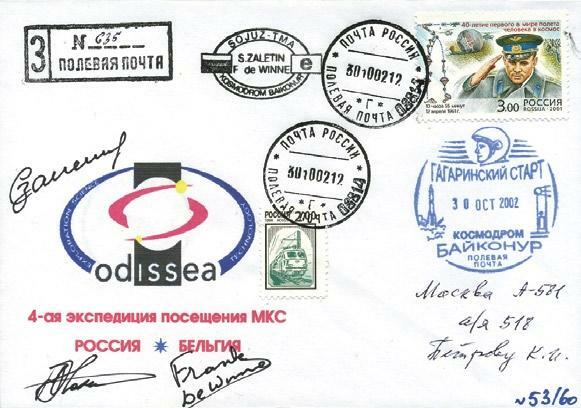 The top quarter of a sheet of 8 for Gagarin’s 70th anniversary of his birthdate (s. 6817) is used along with the Ostankino Television Tower definitive (s.6426) for postage and are cancelled with familiar postmarks for the April 19, 2004 launch. A new hand stamp for “Russia, USA, Europe - Cosmodrome Baikonur” featuring a Soyuz spacecraft circling the Earth, appears below a different Baikonur Registered Mail hand stamp. The next flight to the ISS was the Mission-9S/Soyuz TMA-5 spacecraft, launched on October 14, 2004, with the Expedition-10 crew consisting of Salizhan Sharipov and Leroy Chiao, along with flight engineer Yuri Shargin. The launch was delayed beyond its scheduled October 9, 2004 launch date because an explosive bolt was accidentally activated during preflight testing of the Soyuz TMA-5 spacecraft, the damage was repaired prior to launch. Furthermore, the docking to the space station had to be done manually, as the approach using the automatic system was too fast. The Soyuz TMA-5 was docked at the Russian Pirs module and on November 29 was moved to the Zarya module to make room for a Progress resupply ship. The Soyuz TMA-4 spacecraft with Expedition-9 crew Padalka and Mike Fincke, plus Yuri Shargin landed safely on October 24, 2004, ninety kilometers north of Arkalyk, Kazakhstan. Four different stamps are used to frank this launch cover, including a Crane definitive (s. 6425), and are cancelled with a Russia Post Field Post cancel that utilizes the four digit year format and has a “B” prefix below the date. The purple postmark is from the Gagarin Start launch pad. Note that the postage rate has been steadily increasing and is now 7.25 rubles to ensure delivery. 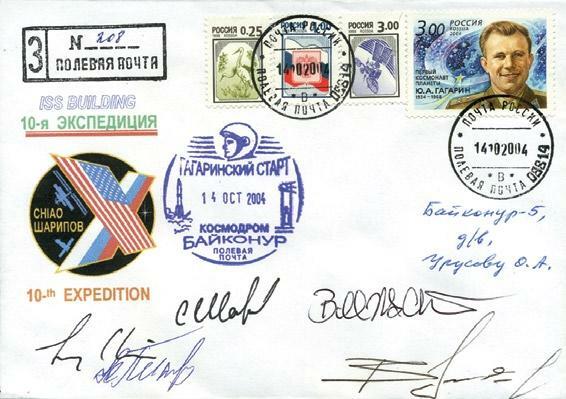 The cachet is for the 10th Expedition with participants Chiao and Sharipov names flanked by the ISS and the Soyuz spacecraft next to the US and Russian flags arranged to make the Roman numeral X (10). Five autographs appear on this cover, with Leroy’s at the far left in black, and a Bill (unknown) at the top right, but the rest are indecipherable because they’re in Russian. The Expedition-11 crew of Sergei Krikalev and John Phillips launched on April 15, 2005 with ESA astronaut Robert Vittori aboard the Mission-10S/Soyuz TMA-6 spacecraft and docked at the ISS on April 17. The Soyuz TMA-5 spacecraft undocking was done manually as a cautionary measure to save power on a faulty battery. Expedition-10 crew Sharipov and Chiao, with Robert Vittori landed safely on April 25, 2005 at their designated landing spot ninety kilometers north of Arkalyk, on the northern steppes of Kazakhstan. The Cosmodrome Baikonur Soyuz TMA-6 cachet depicts the Soyuz booster at the Gagarin Start launch pad, which is why the purple pictorial cancel appears on this cover. Once again the Russian Post Field Post postmarks are used on the four stamps, still using the four digit year format. The extra-bold “08814” that appears on the bottom is a mystery as Russian postcodes are rendered in six-digit format. The Registered Mail rubber stamp is from the Field Post. The next Soyuz flight to the ISS was the Mission-11S/Soyuz TMA-7 spacecraft launched on October 1, 2005 from the Baikonur Cosmodrome with the Expedition-12 crew Valeri Tokarev and Bill McArthur, accompanied by Space Flight Participant, Greg Olsen. By this time, STS-114, the Space Shuttle’s “Return to Flight” had been launched on July 26, 2005 and had docked with the ISS on July 28. Since this was a checkout flight, no crew transfer to the ISS took place. Greg Olsen conducted several experiments in remote sensing and astronomy while aboard the ISS for eight days. The Soyuz TMA-6 spacecraft with Expedition-11 crew of Sergei Krikalev and John Phillips, along with Greg Olsen departed from the ISS on October 10 and during the decent, flight instruments of the Soyuz spacecraft indicated a cabinpressure-leak, but the crew and craft landed safely on October 11, 2005. The cachet features the flight participants, from left to right, Greg Olsen, Valeri Tokarev, and Bill McArthur and the cost of postage has risen .25 rubles. A four ruble ‘Fiftieth Anniversary of the Baikonur Cosmodrome’ stamp with a Soyuz rocket (s.6874c) is accompanied with two definitives (s.6429 and 6630). The Field Post cancel now has a prefix below the date. Mirroring the cachet, Valeri Tokarev’s signature is on the left, Greg Olsen appears in the center, then Bill McArthur has signed on the right above the address. Nine months later the next Soyuz flight, Mission-12S/Soyuz TMA-8, was launched from Gagarin’s Start at Baikonur on March 30, 2006 with the Expedition-13 crew Pavel Vinogradov and Jeff Williams, with Brazilian Marcos Pontes along for the ride. Pontes’ flight was part of the celebrations for the 100th anniversary of Brazilian pioneer Alberto Santos-Dumont’s successful flight in a fixed-wing airplane in Paris in 1906. During his visit to the ISS, Pontes carried out eight experiments selected by the Brazilian Space Agency. The Soyuz TMA-7 spacecraft with the Expedition-12 crew Tokarev and McArthur, plus Marcos Pontes landed safely on April 19, 2006. 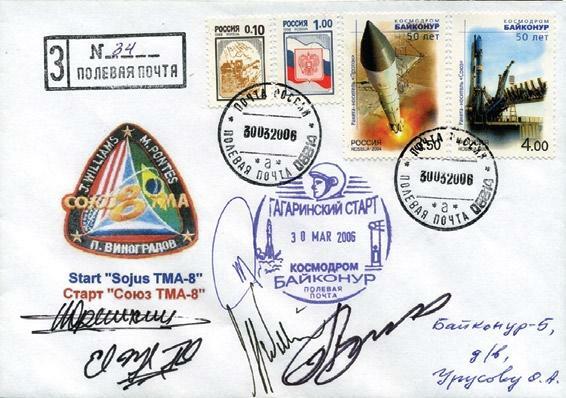 The triangular “Soyuz 8 TMA” mission emblem with the three national flags of the flight participants – USA, Brazil and Russia, serves as the cachet for this launch cover, dated March 30, 2006 with the Field Post ( with an “a” prefix) and Gagarin Start cancels. 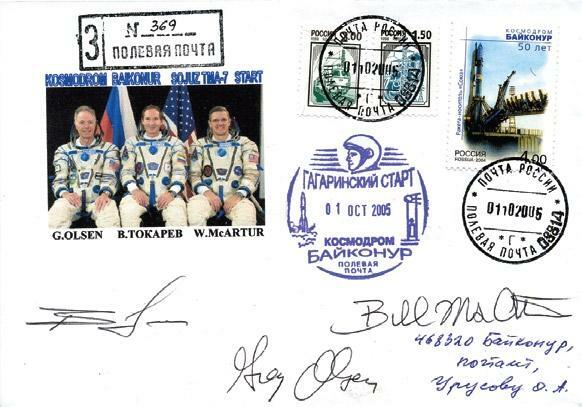 Five of the flight participants, going up and returning, have signed this cover that bears 8.6 rubles of postage, including two from the ‘Fiftieth Anniversary of Baikonur Cosmodrome’ series featuring a Proton launch and the Soyuz on the pad (6874b, 6874c). The next Soyuz flight was the Mission-13S/Soyuz TMA-9 spacecraft launched from the Gagarin Start at Baikonur Cosmodrome on September 18, 2006 with two members of the Expedition-14 crew, Michael Lopez Alegria and Mikhail Tyurin, along with Iranian-American spaceflight participant Anousheh Ansari, who participated in several experiments including research of anemia and lower back muscular pain in microgravity, plus space radiation effects on ISS crew and microbes. For three days, from September 18 to 21, it was the first time since the Columbia accident that twelve humans were in space simultaneously. The Soyuz TMA-8 spacecraft with the Expedition-13 crew and Anousheh Ansari landed safely on September 29, 2006. The cachet features the Soyuz crew photo with, from left to right, Anousheh Ansari – the first and (currently) only female spaceflight participant, Soyuz Commander Mikhail Tyurin, and Spanish-American Michael Lopez Alegria who was the Commander of Expedition 14. With nine rubles worth of postage, the two space-themed stamps with a Baikonur 50th Anniversary series showing a Zenit rocket (s. 6874d) and a Gagarin “First Man in Space” (s. 6817) are cancelled with a single Field Post postmark sorting a “B” prefix, a rarity in that most Russian covers tend to have multiple strikes of the same postmark. A purple Gagarin Start postmark also makes an appearance. The Mission-14S/Soyuz TMA-10 spacecraft was launched on April 7, 2007 with the Expedition-15 crew of Commander Fyodor Yurchikhin and Flight Engineer Oleg Kotov, along with Spaceflight Participant Charles Simonyi from Hungary in the third seat. After a one day delay due to boggy conditions at the landing site, the Soyuz TMA-9 spacecraft departed from the station on April 21, 2007, with the Expedition-14 crew and Charles Simonyi, landing safely on the Kazakhstan steppes north of Arkalyk. When the capsule landed after 215 days in space, exceeding the 210-day warranty for a Soyuz TMA spacecraft, it concluded the longest flight by a Soyuz spacecraft. Once again the postage continues to rise as this cover required ten rubles. Several older postmarks make a return appearance with the Soyuz pictorial striking the two top stamps (s. 6428 and 6817), the Russian Post dual language Soyuz/Baikonur cancel on the right, and the Baikonur Postcode version canceling the Zenit stamp (s. 8674d). 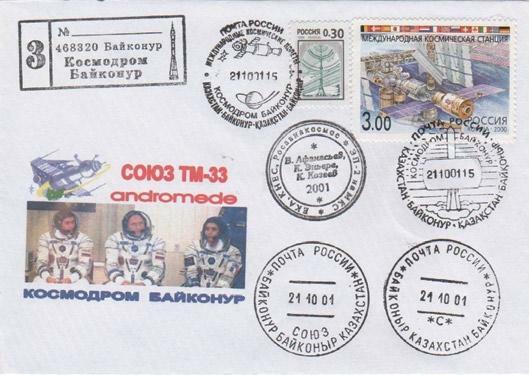 The Baikonur version of the Registered Mail rubber stamp in the upper left corner also makes a return appearance. The three autographs are in the same order as the cachet, showing from left to right, Charles Simonyi, Oleg Kotov, and Fyodor Yurchikhin. The green text above the cachet reads “15th Expedition to ISS”. Another cover for Soyuz TMA-10 shows the Expedition 15 mission emblem nextto the three crew members Simonyi, Kotov, and Yurchikhin in the traditional pre-flight photo suited up, over a photo of the ISS in orbit. 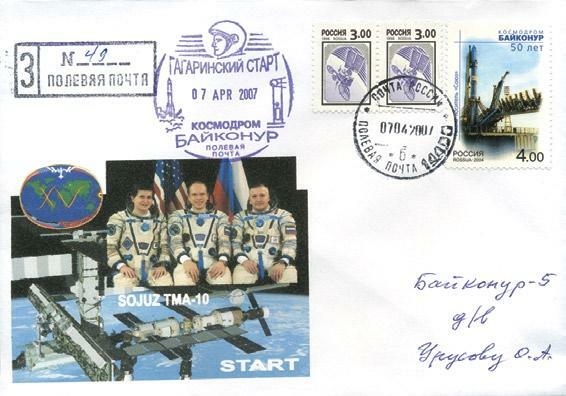 A single Field Post postmark with a “Ð±” prefix knocks out three space related stamps (s. 6432 and 6874c) and the familiar Gagarin Start postmark in purple makes another appearance for the April 7, 2007 launch. The next flight was the Mission-15S/Soyuz TMA-11 spacecraft launched on October 10, 2007 with the two members of the Expedition-16 crew, Yuri Malenchenko and Commander Peggy Whitson, along with Spaceflight Participant Sheikh Muszaphar Shukor from Malaysia who flew as a guest of the Russian government in exchange for Malayasia’s purchase of Russian fighter jets. Sheikh Shukor trained at Star City and despite the Spaceflight participant designation, fellow cosmonauts considered him to be a full-fledged cosmonaut. The Soyuz TMA-10 spacecraft with two of the Expedition-15 crew members Yurchikhin and Kotov, plus Sheikh Shukor undocked from the ISS on October 21, 2007 and during atmospheric re-entry, a damaged control panel cable caused the spacecraft to go into a ballistic reentry mode, landing 340 kilometers west of the intended landing site near Arkalyk. The crew survived the wild ride and was subjected a g-load of as much as 8.6 times normal Earth gravity for a short time. This cover has a multiple subject cachet, with the Soyuz-FG launch, the crew patch with a Soyuz TMA in orbit, and the three member flight crew posing for the standard preflight photo. Sheikh Shukor is on the left next to Malenchenko, with Whitson, the first female commander of the ISS on the right. The postage has leveled out at 10 rubles and two of the Baikonur 50th Anniversary stamps fill the bill and are cancelled with another single Field Post postmark with a “Ð±” prefix, and the Gagarin Start postmark in purple also notes the October 10th launch. The sans serif version of the Field Post Registered Mail hand stamp is used on this cover. The first manned Soyuz TMA flight for 2008 was the Mission-16S/Soyuz TMA-12 spacecraft launched on April 8, 2008 with the Expedition-17 crew of Sergei Volkov and Oleg Kononenko and Spaceflight Participant, So Yeon Yi, a female Korean astronaut. Yi So-yeon flew as a guest of the Russian government through the Korean Astronaut Program after the Korean government paid the Russian government 25 million dollars in agreement to support the first Korean astronaut in space. Fellow Korean astronaut Ko San was originally scheduled to fly but in March of 2008, it was announced that Ko had breached regulations surrounding removal of books from the Star City training center, and therefore would not be allowed to fly. During her mission, Yi So-yeon carried out eighteen science experiments for the Korea Aerospace Research Institute. The Soyuz TMA-11 spacecraft undocked from the ISS on April 19, 2008, with two of the Expedition-16 crew members Commander Peggy Whitson (USA) and Flight Engineer Yuri Malenchenko (Russia), along with Yi So-yeon (Korea) and was the first time two women flew together on board a Soyuz. Although the vehicle landed safely, it suffered a partial separation failure which caused a ballistic re-entry that in turn caused it to land 475 kilometers west of the intended landing point. Later, Anatoly Perminov, the head of the Russian Federal Space Agency, speculated that the ballistic reentry was connected to a Russian nautical superstition that having more women than men on a craft was unlucky. Russia Post processed this cover and cancelled ten rubles worth of postage, including the R-7 missile version of the Baikonur 50th Anniversary set (s. 6874a), with each variety of stamps getting their own postmark, including the Soyuz pictorial and the Soyuz/Baikonur versions as seen on previous covers, plus a new variety at the bottom, which reads, [State Unitary Enterprise] “Baikonur Communications” which usually applies to communication satellites and may have been applied in error. 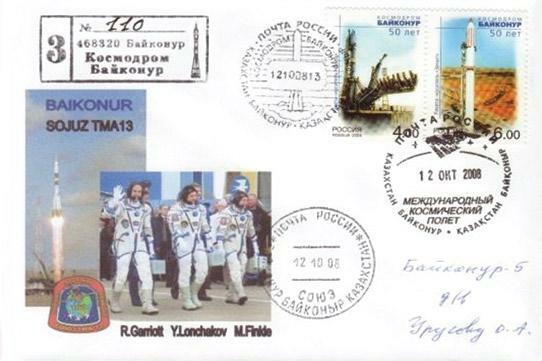 The old style Baikonur Registered Mail imprint is used on this cover. The last manned Soyuz TMA flight for 2008 was the Mission-17S/Soyuz TMA-13 spacecraft launched on October 12, 2008 with two of the Expedition-18 crew members Michael Fincke and Yuri Lonchakov and Spaceflight Participant Richard Garriott, a video game developer and the son of astronaut Owen Garriott who flew with Skylab 3 and STS-9. By some counts, Soyuz TMA-13 was the one-hundredth Soyuz spacecraft to be manned. Salizhan Sharipov had originally been assigned to command this Soyuz flight and participate in Expedition 18, but was replaced by Yuri Lonchakov. The Soyuz TMA-12 spacecraft with two of the Expedition-17 crew, Volkov and Kononenko, along with Spaceflight Participant Garriott landed safely in Kazakhstan on October 24, 2008, resuming the Soyuz TMA’s standard of reliability after the two previous ballistic descents. 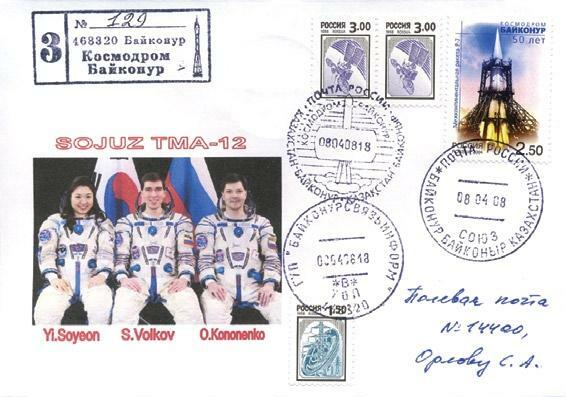 A new postmark, an official International Space Station cancel from the Russia Post makes an appearance on this Soyuz 13 launch cover along with the Soyuz pictorial and the Baikonur/Soyuz variety, all dated on October 12, 2008. The ISS version ties the two Baikonur 50th Anniversary stamps to the cover. The cachet features the Soyuz launch rocket lifting off from the Baikonur Cosmodrome, the three crew members Richard Garriott, Yuri Lonchakov, and Michael Fincke walking towards the rocket, and a small Soyuz TMA-13 mission patch. 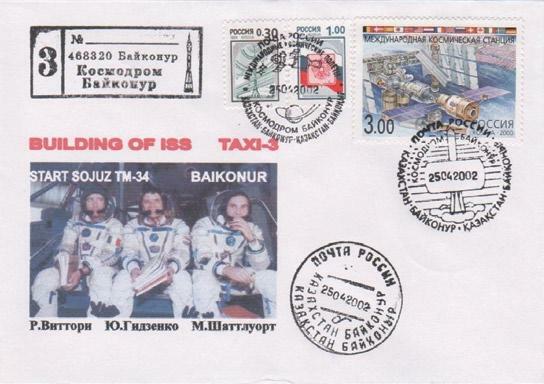 The second cover has the same three cancels as above, with the ISS version over a Kazakhstan stamp (s. 261). The cachet is also similar, but with the Soyuz TMA-13 spacecraft approaching the ISS. The covers featured in this article are produced by two collectors/dealers in Russia and Kazakstan, and sold for 7.5 to 10 Euros through dealers, collectors and clubs in Europe. Attempts to send your own covers to Russia to have them serviced would, unfortunately, result in a loss of covers and money.